When we start talking about "fixing up" our light plane for the new season, there aren't a heck of a lot of types that give us a choice between dressing them in fatigues or civvies. There's the Cub/L-4 and the rest of the grasshopper series and you could probably repaint your early King Air as a C-12. Even the lowly Twin Bonanza could be passed off as an L-21, if you have a well-developed sense of humour. There are, however, very few airplanes tht fit the "fix-em up" category and combine a khaki personality with serious civilian utility. One of the leaders in that narrow aero niche is the North American/Ryan Navion, also known as the L-17A, B or C.
The Navion/L-17 is a series of extreme contradictions. For one, it's an airplane people either ignore completely or idolize as some sort of flying diety. There seems to be no in-between. I am one of the ignoring crowd. I don't really dislike the airplane. I just don't normally notice it. Don't ask me why, I don't know. The Navion just doesn't jump out and grab me, which is a serious mistake. I found out just how serious a mistake when I recently dropped in on my good compadre Jim Clevenger in Marion, North Carolina. Jim lives on one of those grassy valhallas we all know exist, but never seem to find. He strolls out of his house directly to his SNJ or Swift or C-210 or...well you get the picture. We always have a helluva good time down there between burning up .45 ACP and Avgas. We also spend a lot of time hangar flying. At Marion that means shooting the breeze about everything with everyone who walks by. Naturally airplanes are on the top of the conversation list. The "manager" of the Marion airport is Gene Padgett. Gene is also the quintessential airplane trader, having owned God-knows how many Swifts, Luscombes and Navions. He runs in streaks and I've never known him to have less than two of any given airplane. When he decides to leap on a particular type, he leaps in waist deep. The last trip, he was into Navions. He always start talking about his current aeronautical passion with, "...well, you know, it's just a darned good old airplane." If he owned a Custer Channel Wing, he'd start the conversation that way. So, I smiled when he started on his Navion sales pitch. I nodded politely and then remembered Gene had excellent taste in flying machines and he knew I wasn't going to buy anything. So, his sales pitch had to have a modicum of truth. One little detail I found immediately interesting was to foreshadow my overall evaluation of the airplane: The welded step that dangles down in front of the wing is not only made of steel, but the step portion is of diamond pattern boiler plate! Yep, that said as much about the airplane as anything. Every little piece of the airplane was built to give service for the next several hundred years. The canopy rails look to be bullet-proof. Knocking on the wing leading edge results in a dull "thunk," like knuckling the edge of a kitchen sink. Sliding the canopy forward results in a rumbling sound like rolling a piano across a hardwood floor. Solidity personified. All this beef results in an empty weight (according to my trusty William Green everything-about-airplanes book) of 1782 pounds. Well, the Navion shouldn't be a featherweight. The useful load is just short of 1000 pounds. That's impressive! Let's see, four standard issue lard butts total 680 pounds and the 40 gallons of fuel (20 more in aux. tanks) adds 250 pounds, which leaves 70 to 100 pounds for baggage. No wonder the Air Force took the little bird down off the civilian shelf and put it to work. A fact picked up courtesy of Gene Padgett is that the bird wasn't originally aimed at the military. It was another of those airplane-in-every-garage postwar daydreams. Newly civilianized pilots were supposed to gobble up the airplanes and the sales would keep North American's airplane plants busy. Only it didn't happen that way. Civilianized pilots were gobbling up Chevrolets and getting the baby boom started. 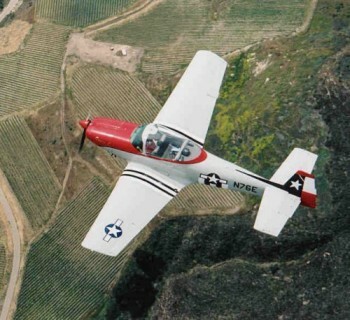 Had it not been for the military stepping in with their check-book, the Navion might have wound up right next to the Aeroflight Streak or the McKinnon 165 as a still-born infant of the boom that didn't happen. The military did step in, in a very big sort of way. Apparently they were looking for something a general could climb into as a passenger and feel as comfortable as he did in his limo. The same general could also fly it and not break his out-of-practice neck. He would also have to work awfully hard to break the airplane. The combination must have appealed to a general somewhere because North American delivered over 900 airplanes to the government before selling the license to Ryan Aeronautical Corporation. Ryan delivered another 158 airplanes to the government and updated some of the earlier airplanes. It seems North American didn't need the work because of an airplane named Sabre and a place called Korea. In total, nearly 1100 Navions were built for the military. Another 1100 were built for the civilian market so, by 1951, over 2200 in total had taken to the air. 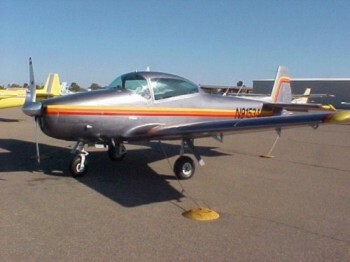 Probably the most important fact about the Navion's longevity is that about 1400 of the machines are still listed on the civil' register as being flying airplanes. That is a survival rate of about 60%, which may be the highest of any airplane ever built - . . some of these airplanes are 40 years old. What's the survival rate of the rest of the class of 1947? Doubt if it's that good. The original airplanes used the 205 horse Continental E-185-3 engine with several different propellers screwed on the front. You'll see lots of variations but the most common and the one Gene had on his airplane is the original Hartzell controllable, which is a "variable pitch" prop. It isn't constant speed since, at a given prop setting. moving the throttle also moves the rpm. If the pilot resets the prop, he can maintain the proper manifold pressure/rpm relationship. The airplane got a shot in the arm in 1951, when a geared Lycoming was hung out front and the horsepower rating jumped to 260. Throughout the 1950s and early 1960s someone was always reviving the Navion. It got a bunch of different engines shoehorned into the nose and even gave up its sliding canopy when it became the Rangemaster. Also, a dead stock Navion is almost a rare bird since so many of them have been modified. The most popular mods get rid of a bunch of bars in the canopy side glass but there are dozens of other major changes in the airplane as the result of the love affair so many pilots have with the machine. 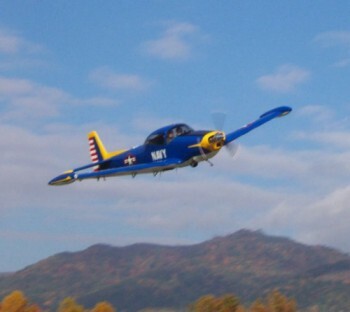 With the exception of the canopy glass, Padgett's L-17A replica was nearly a stock Navion. Boarding a Navion is a truly unique experience. I don't know of another airplane that you climb over the leading edge via the aforementioned sturdy step. To steady yourself, a handle which looks like it should be pulling open a drawer full of wrenches in your shop is fixed to the upper cowl region. It really is a straight drawer pull with no attempts to hide or streamline the unit. Once up on the wing (and you are really "up;' about five feet off the deck), the first impression of the cockpit is that it is a yawning pit the size of a 1000 gallon watering trough. Getting in is a simple matter of stepping over the sill into the broad (and we do mean broad) area between the front and back seats. It's almost a silly feeling . . . walking around bolt upright in a four place airplane isn't possible! A short stroll between the front seats is necessary to get to the flight deck, where the pilot takes his seat as if he was sitting down at a ball park .. - all very civilized and very different. This method is a great arrangement, unless it happens to be raining cats and whatever. While climbing into Gene's airplane and settling down into the seat, it was impossible not to notice the size of the instrument panel. It was one of the very widest I've seen in an airplane this size. And the visibility? It's terrific! A jab with the throttle, a tap on the starter and the engine cranked over and burst into that characteristic harsh (sort of agricultural sounding) exhaust tone. As we taxied out to the runway, I made a mental note as to my approximate height above the ground because I knew I'd have problems finding the runway when we returned. Before dropping the hammer. Gene explained the hydraulic system, which is much like the momentary systems on SNJs and early AT-6s, except it stays on when actuated. The system has to be activated by pushing down on a centrally mounted button/lever which gives hydraulic power to retract or extend the gear. No push, no retract. If you throw the gear lever down without activating the hydraulics, nothing serious will happen since the gear will unlock and free fall into position. We elected to go with no flaps, but Gene showed me how the book says to set them for takeoff, should I need to know, Just twist the control wheel all the way in one direction, then lower the flaps to match the aileron deflection. Great idea! Unlocking the vernier and pushing in gave me more noise than acceleration at first, but then the airplane gathered its aluminium wits and started down the runway at a civilized pace. As the controls felt life was being fed into them by the building airspeed, the control wheel was gently loaded which obediently lifted the nosewheel clear, letting me run on the mains. I continued putting a load on the wheel and the airplane skipped once and then lifted off into a solid. no sink climb, A quick punch of the button and moving the gear lever started the gear up and we were on our way. Gene told me to hold 85 mph, which gave about 700-800 fpm, climb with two people and nearly full fuel. Even at this early point in the flight it was easy to see why so many love the airplane . . . it has an incredibly steady secure feeling. Put the Navion on a speed and it stays there. Drop a wing into a turn, and the plane will hold the turn by itself. Once at altitude I brought the power rack, completely forgetting the prop wasn't a constant speed. I wasn't paying much attention to it until I noticed I was constantly tweeking the prop control. Then I remembered and let everything stabilize before trying to match the prop with the manifold pressure. At 4000 ft MSL and 21 inches and 2100 turns, the airspeed settled on 125 knots. Gene then said something about ". . . does a great barrel roll." This I ignored, although there was some fairly noticeable turbulence shortly thereafter that took some unusual attitude recovery techniques to tame. There isn't much to say about droning along in a Navion except it does just that...drones along. The Navion's roll rate is fairly leisurely and the control pressures are surprisingly light (like a Beech product) and smooth, but otherwise you could be cruising in your '51 Packard, Honest! That's the only comparison I can think of. No modern four place airplane has the size and comfort of the Navion and the panel, although not as jukeboxy as many pf its peers, is remarkable only for the amount of gear you could stuff into the broad surface. With a little forethought and modern instruments and avionics, this thing could be set up like a 757 and have room left for a glove box. And yes, it would make a hell of an instrument platform. Gene didn't opt for the avionics, but he did add little arm rests on each side of the cockpit that are perfectly placed to rest your arm while lightly holding the control yoke I wouldn't have thought such a small addition could do so much for an airplane's cross-country comfort. Coming back into Marion I just dropped the nose and let the airplane burn off altitude while the speed built up to 150 knots or so. As we came smoking into the pattern, all it took was pulling the power and a tight turn to bring us down to 100 mph so I could get the gear out. And, yes, at first I did forget to hit the hydraulic button, but caught myself at the last second. Gear out, the Navion didn't take much trim to hold it and I went for half flaps on a wide base. Turning final I stopped the flaps just short of full and forced myself to bring the airplane down to 70 mph which seemed unbelievably slow for an airplane that flew so much like a big airplane. It wasn't until we were on short final that I realized the Navion has the rock steady characteristics usually associated with much heavier airplanes. We were obviously a little high and Gene urged me to just drop the nose and let it sink. This was done and the airspeed didn't seem to know the difference since we didn't gain 2 knots in what should have been a 10-knot manoeuvre. With everything hanging out, the machine has enough drag you can get away with that type of manoeuvre within certain limits. All the way into the airport Padgett kept telling me. "...just land it like a Skyhawk, just land it like a Skyhawk:" What he didn't know was I couldn't remember the last time I landed a Skyhawk. Drawing on dim memories of forgiving machines which like to have energy burned off before hitting ground effect. I broke the glide and started looking for the ground. Pull it, pull it, hold it off... thunk! We had arrived! I doubt if I've made a first-time landing in any airplane that was so easy. The nose was simple to hold off, while we slowed on the mains, and I had complete control over everything as I let the nose come down. Gee, if a Skyhawk is this easy to land, it must be a sweetheart. Like I said, it is a serious mistake to ignore Navions. Here is an airplane that has familiar names like Delco Remy stamped on most of its parts, making the airplane one of those that relies on common sense, not super sophistication, to support. All of its systems are ex-military, so they were designed to be maintained by 19-year-old privates who didn't want to be there in the first place. Also, most of the systems are so overbuilt, those same 19-year-old privates couldn't screw them up and the 50-year-old generals couldn't break them. If we want to start talking about airplanes that are a fantastic basis to start building from, then the Navion should be one of the first discussed. Paint it in the most bizarre civilian scheme you can imagine and that's okay. Or go to the other extreme and polish the living hell out of it, throw on a few stars and bars, then stand back and salute the final product. What some airplanes are all about is building them to suit your own taste. That's definitely what the Navion is all about.